Cara McFadden and Dan Martin, respectively a partner and a director at Guidehouse, received the Department of Defense's Patriot Award for leading efforts to assist employees who also serve as Army National Guard and Reserve members. The DoD's Employer Support of the Guard and Reserve program recognizes individual supervisors who have demonstrated patriotic support and cooperation to their veteran employees, the company said Friday. 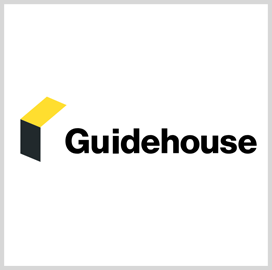 "Twenty percent of our employees have a military background, across branches and ranks," said Scott McIntyre, CEO of Guidehouse, and a 2019 Wash100 winner. "We applaud Cara and Dan for this prestigious accolade," McIntyre added. Ryan Kwan, a reservist and Guidehouse senior associate, submitted the nominations while ESGR volunteer Melinda Jones presented the award.